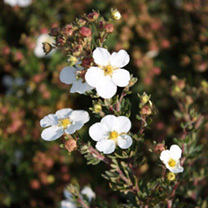 Potentilla White Lady is a low growing deciduous shrub which, as the name suggests, produces pure white flowers throughout summer. The greyish-green foliage spreads out beneath the flowers to provide attractive ground cover, or alternatively it is ideal to plant in a sunny border where it will be a haven for pollinating insects. Height 50-60cm. Supplied in a 3 litre pot.